hello dear friends! hope your weekends are going well. just wanted to post a quick update about the lovely package exchange, for those of your participating! lovely package flickr group - don't forget to take pictures of your package! and if you get a chance, please upload them to the flickr group so we can all see your lovely package. 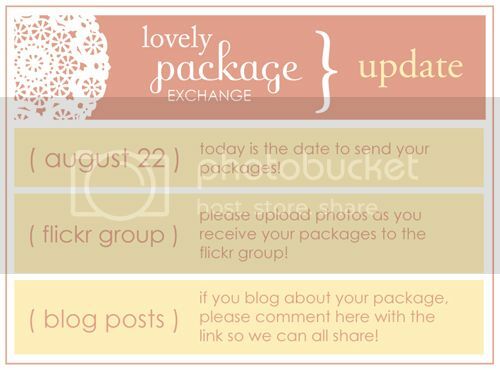 blog posts - if you blog about your sent + received packages, please post the link here! I'd love to see everyone's packages and share them here in a follow up post! and if anyone is having an issues or concerns with their partners or the exchange, please let me know. thanks everyone! ps: i have received many emails and inquiries to whether or not there will be another exchange in the future - the answer is: most definitely! most likely in the fall or even a Christmas exchange! so keep an eye out! A christmas package exchange sounds lovely, I might participate with that one. hello! I had fun doing the packages! Thanks for creating this; it was probably a lot of work to do the arrangements and all. I'm waiting for my package still. here is a link to the blog post on which i have pictures of the package i sent and the one i received. this was such a treat! thank you for hosting, Danni! i appreciate all your efforts in working out the assignments! Hi, I've just posted some pictures of the package I've sent on Flickr - only the outside since it hasn't arrived yet. But I forgot to take pictures of the envelope - I was in such a rush to get to the post office before they close! thank you for visiting my little blog today. what a treat to see a note from you. i blogged the rest of my swap today - she received her package! i so enjoyed this. so fun to buy from some of my favorite shops with a good excuse and even funner to set aside some quiet crafty time for myself. thanks for organizing it. Here's a blog post on the exchange... http://thehangingflower.blogspot.com/2009/08/recap-package-exchange-recent.html and I'll add the photos to the flickr group as well! When's the next one going to be! ?